Symbolising faith and hope, opals make a lovely heartfelt gift. Especially when they're accompanied by diamonds. 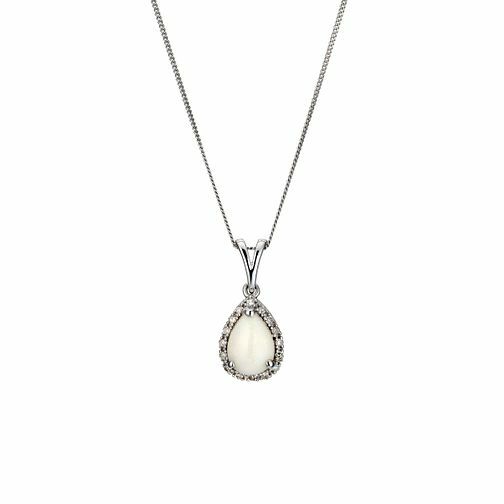 This pretty opal teardrop pendant softly shimmers and glows, edged by glistening diamonds. Complete the look with matching earrings. 9ct white gold opal & diamond pendant is rated 4.7 out of 5 by 3. Rated 5 out of 5 by Anonymous from Elegant and even better than expected A rare purchase, for me, online without seeing the item in person. I liked the design and, when it arrived, it was even better than I hoped. My wife was very pleased too! Rated 5 out of 5 by Anonymous from Delicate and lovely necklace The Opal is beautiful and shimmers in the light. The colour is unique as is all opals. The chain and clasp are delicate which makes this item look more expensive than it is. I bought this in memory of my mum whose birthstone was Opal.